All that said, I want to like the color pink. I want the freedom to reach for it to balance out other colors in my quilts. I want to be able to incorporate a novelty print that uses pink as its background. So I decided to push myself. Some of our closest friends are expecting a baby girl in a few months. 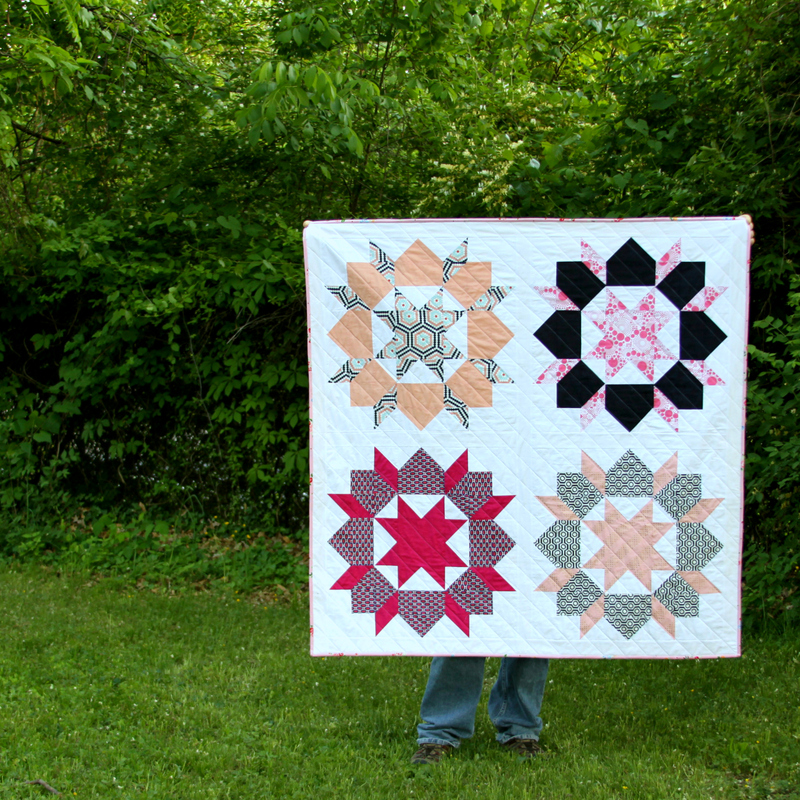 I wanted to see whether I could use the color pink in a quilt I didn’t hate. And I succeeded! The palette is actually pink and blue, but I think it’s still clear that the quilt is for a girl. 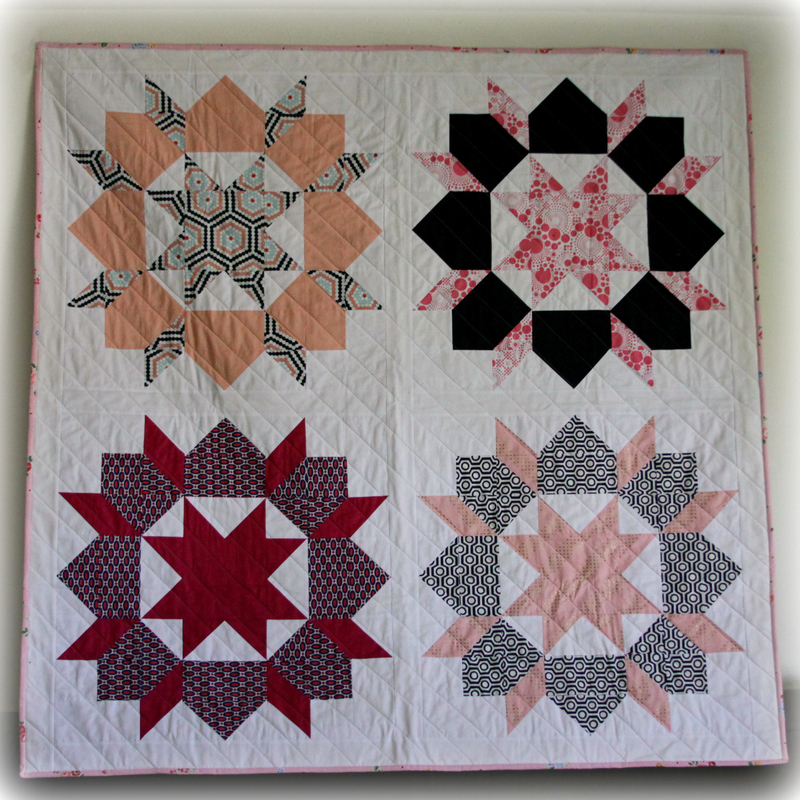 The Swoon quilt block pattern by Thimble Blossoms is available here in a variety of sizes. I also have the mini version. It was really simple to sew. I was impressed that even when I wasn’t taking my time, everything seemed to line up just fine! Great pattern. Since the couple lives in NYC, I also wanted to incorporate the place of the baby’s birth. 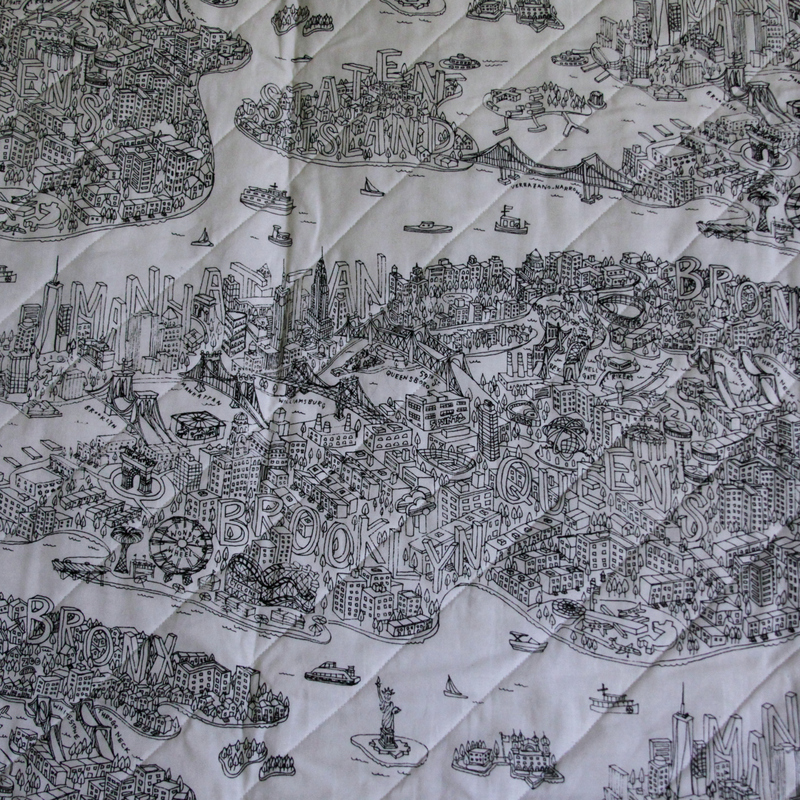 The backing fabric is Great Gotham by Samarra Khaja and depicts the five boroughs. Isn’t it adorable?! It’s out of print, so snag some if you see it! One final note: I used the quilting bar on my new Janome machine, plus the Accufeed quilting foot. WHOA. I always wondered how quilters got such perfect rows and even stitching. Yes, it’s possible to replicate these things on a less advanced machine, but it is WAY easier and looks WAY more professional if you have the right tool for the job! I’m still so thankful for my awesome machine. It sews like a dream. AND IT’s NOT PINK, haha. Categories: Quilts | Tags: boroughs, gotham, gotham fabric, matchstick quilting, new york, new york fabric, nyc, nyc fabric, pattern, quilt, quilting, samarra khaja, sew my stash, sewmystash2015, swoon, swoon block, swoon pattern, swoon quilt, timeless treasures | Permalink.